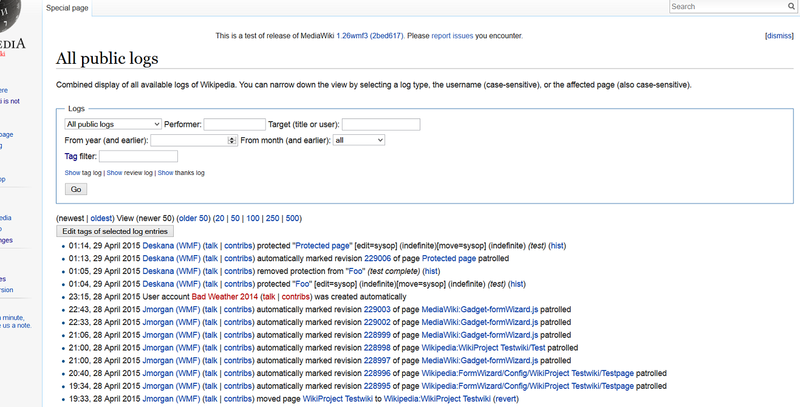 Go to [[Special:Log]] on any 1.26wmf3 wiki. Ensure you are not granted the deleterevision right. The ability to delete revision/log entries seems to force the checkboxes to be displayed. PeterBowman raised the priority of this task from to Needs Triage. PeterBowman added a project: MediaWiki-Change-tagging. PeterBowman added a subscriber: PeterBowman. Aklapper added a project: Regression. Jdforrester-WMF edited projects, added WMF-deploy-2015-05-06_(1.26wmf5); removed Patch-For-Review, Regression.